When a third party or custom mail journaling system is implemented for legal, procedural or accountability reasons, you need to be confident it will be accessible, readable and accurate. Because most such journaling systems are stored in a standards-compliant format such as EML, there is a need to convert journaled emails with fidelity beyond that offered by the native IBM Domino system. CoexLinks Journal is a premier solution for high fidelity rendering when mail is stored in local or remote journaling systems such as Bloomberg Vault. The native Domino Mail Journaling system is used to ensure reliable and secure handling within Domino, while CoexLinks Journal provides flexible and configural handoff to separate journaling solutions via SMTP, local file handling or streaming. Many emails are formatted carefully with the expectation that the recipients will see what has been created. Without a high fidelity conversion to EML/HTML, your archival system may return deceptive, incomplete, ill formed or unprofessional appearing results. CoexLinks Journal ensures you put your best foot forward at the time archival results are needed. A license for CoexLinks Journal™ is required for each IBM Lotus Domino server which uses the software, as well as each user mail database to be journaled. Server licenses are an annual $6000 US, while user mail databases start at an additional annual $15/db. Full pricing and licensing information may be found on our CoexLinks Fidelity pricing page. For an official quotes, please contact us by phone at +1 216-991-5220, or by e-mail at Sales@GeniiSoft.com. Maintenance and upgrades are included as part of the annual license fee. Licensing must be maintained continuously from year to year in order to continue use of the software. 1) Do I have to change the design of my applications to use CoexLinks Journal? No. CoexLinks Journal runs as a plug-in, invisibly making changes as the Domino Mail Journal documents are generated, with absolutely no code changes required. This makes it very easy to install, and allows it to work with third party journaling packages. 2) Is CoexLinks Journal easy to install and configure? Yes. Installation is simply the addition of a DLL (shared library on UNIX systems) and a license file in your Domino data directory. Configuration is almost as simple, requiring the addition of a few lines in your NOTES.INI file. After that, CoexLinks runs as part of the Domino server software. Additional configuration in the Domino Directory may be required if the third party journal software requires separate SMTP addresses per user. 3) Does CoexLinks Journal use any unsupported calls that might cause trouble in future versions? No. CoexLinks Journal is written using completely standard and portable calls in the C API toolkit, along with manipulation of structures defined in the C API headers. This doesn't mean it was easy to write, just that all calls and structures are guaranteed by IBM not to change, thus ensuring reasonable upward compatibility. 4) Is CoexLinks Journal tied to a particular version or point release of Domino? No. CoexLinks should work with all versions and point releases in Domino 6.5 to Domino 9.x without any alteration. Obviously, new feature releases would require re-testing before they could be certified as supported. 5) Does CoexLinks Journal need to be installed on every server? Not necessarily. 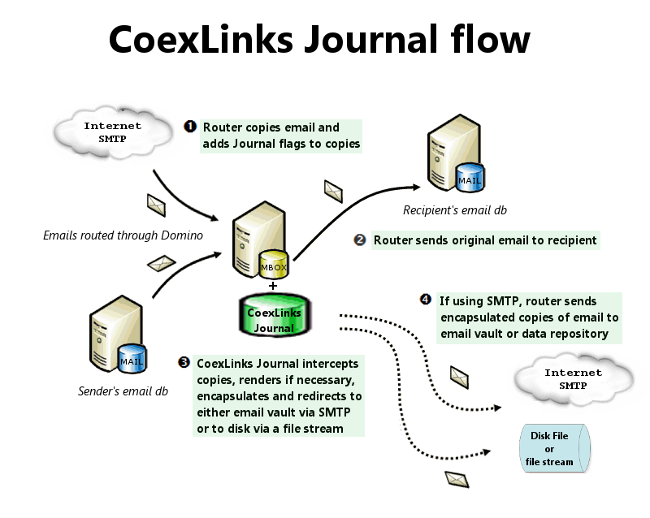 CoexLinks Journal is designed to handle every generated Domino Mail Journal message, so it need only be installed on servers where all or specific user mail will be journaled..
CoexLinks Clipper works on IBM Notes clients under Windows, so if you choose to use that utility, it would need to be installed on those clients. 6) Will CoexLinks Journal redirect my mail to my new address? 7) Do you have local support in [name that region]? Yes and no. Our main offices are in Cleveland, OH in the United States but support is available all over the world. With customers in 48 countries, we are very familiar with the issues in supporting companies in different locales. When a problem arises, our developers and support staff are prepared to deal with it no matter where the customer resides. 8) How do I know Genii Software will still be there next week or next year? There are never any absolute guarantees, but Genii Software has been around since 1994, and providing Notes solutions and supporting Notes customers since 1995. While bigger companies have failed with the dot com bust or the latest global recession, or simply through overreaching, we have stayed strong and grown by focusing on our areas of expertise and by never forgetting the customer.